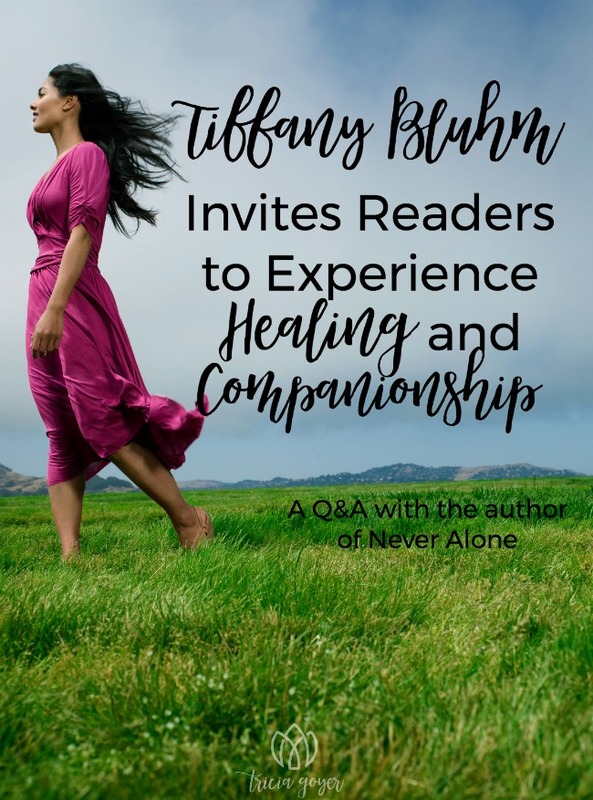 Enter below for a chance to win a copy of Tiffany Bluhm’s Never Alone. Winner will be e-mailed next week! Loneliness is on the rise in our society and impacting people of all ages. Research has shown that it increases stress and high blood pressure, weakens blood flow and immune systems, and is linked to mental disorders, depression, and even early death. It isn’t something to ignore, but rather it’s a signal for us to pay attention. Unfortunately, its negative associations, such as a weakness perception or feeling of having poor social skills, impede people from being honest about where they stand. To make matters worse, it has contagious tendencies, and our social networking culture makes it viral. To break the cycle, we need to understand what loneliness does and the behavior it encourages, seek to be more positive and discerning, and retrain how we think about people. For persons of faith, that includes re-evaluating what loneliness has led us to believe about God and our relationship with him. 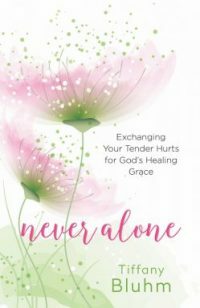 The debut book, Never Alone: Exchanging Your Tender Hurts for God’s Healing Grace (Abingdon Press), by Bible teacher and speaker Tiffany Bluhm serves as a guide to help women do just that. Q: Of all the fears there are in the world, how prevalent is the fear of being alone? Q: Why do women need to hear and be reminded they are never alone? Hearing they are never alone addresses women’s worst fear that they’ll be left alone, rejected by the people around them simply for who they are, what they have done, or what’s been done to them. Q: What was your inspiration for writing Never Alone and its companion Bible study? Q: What is the main message you have for your readers? Whom did you write Never Alone for? Never Alone claims you are not too far gone, beyond repair, or too broken for the companionship and grace of Jesus. Jesus restores dignity to women when the world tries to rip it away from them. The person you were intended to be is found when you work through the dark parts of your story and soul and cling to Christ through it all. If you ask him, the light of Christ will heal you, restore you, and lead you on. Never Alone is for women who have allowed shame, despair, rejection, and loss to define their lives. No matter how small the incident or how big the trauma, we were built to walk in the fullness of God, never a counterfeit version determined by our life’s aches and pains. Q: How did being adopted contribute to feelings of shame and loneliness throughout the years? Did adopting your son change how you viewed your own experience? From my earliest memories, I remember feeling different. I knew straight away I was different. 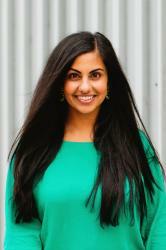 My family is white, and I am East Indian. My childhood was spent wishing my skin was brighter and my story didn’t involve a mama giving up her baby. However, that was my story. I’ve wrestled with shame and loneliness for being different, for being abandoned. No matter who you are, when the understanding of your origin story is understood, one that began with abandonment, it messes with your understanding of worth. From the time we’re little girls, we long to be loved and accepted—from the playground to the lunchroom to the places where we live and work as grown women. We do our best to prove we’re lovable and to avoid being left all alone. But the truth is that it’s impossible to walk through life without experiencing the pain and loneliness of betrayal, shame, guilt, loss, judgment, or rejection. These wounds can shape our views of ourselves, others, and God and even make us question if we are worthy of love and acceptance. Whether old or new, our heartache can convince us there’s no one who understands or cares. Yet Jesus tells us a different story. Tiffany Bluhm is a speaker and writer who is passionate about helping women come to know their worth, value, and purpose because of a loving, redeeming God. In an engaging and relevant approach that speaks to women right where they are, she shares insights from a life spent chasing after Jesus while walking alongside women from suburbia to the inner city, jails and brothels, and the slums of Kolkata. Because of her own story of international adoption and the adoption of a son from Uganda, Tiffany has a heart for women and children in the margins and has created a number of unconventional outreaches to serve them. In addition to speaking regularly at conferences and events, she leads a local gathering called Sip and Savor, where women break bread, study God’s Word, and commune with God and each other. Tiffany writes for a number of online and print publications as well as popular blogs, including Deeply Rooted Magazine, ScaryMommy.com and YouVersion Bible App, and her own weekly blog at TiffanyBluhm.com. She lives in Tacoma, Washington, with her husband and two sons.